I want to celebrate and encourage a love for one’s work. 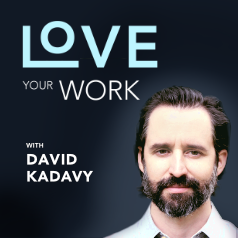 My new podcast, Love Your Work (iTunes, Stitcher), launches today. On this show, you’ll meet entrepreneurs and creators who have carved out success by their own definition. They’ve discovered that which only they could bring to the world, and “bringing it” they are. They won’t all be millionaires, but they will be happy people – or better yet, content people. I’ll dissect how they found themselves doing what only they could be doing. How are they inherently wired, and what past experiences have shaped their work? Where were the forks in the road, and how did they decide which way to go? There appears to be a prevailing belief that one should “do what [one] loves,” and this is not the same as “[Loving] Your Work.” Some seem to think that you can just find a thing you love to do, and somehow, magically, that will turn into a living, if only they optimize enough landing pages, buy enough Twitter followers, or follow the right methodology. Pleasure can be had in the act of working. In spending many hours – sometimes without a clear objective. Love can be found in finding a state of flow, but it also can be found in the sense of satisfaction one feels after fighting through the inevitable discomfort one encounters in the course of Work. It is through these things that an entrepreneur brings into the world something that only they could offer. I’m debuting today with three episodes, and more will follow in a couple of weeks. This is a critical time in the life of Love Your Work. This is the ONE CHANCE to be featured in the “New and Noteworthy” section of the iTunes store. This would bring in more listeners, and more listeners would mean I could add to the many hours I’ve spent crafting this show, and bring you the best guests possible. But, Love Your Work needs reviews. So, if you want to hear more episodes of Love Your Work, can you please review it on the iTunes Store? Oh, and also subscribe, so you don’t miss future episodes.